In a refreshing turn of events, a young Black girl is being applauded for her beauty and has gone viral after a photographer shared pictures of her on their Instagram account. 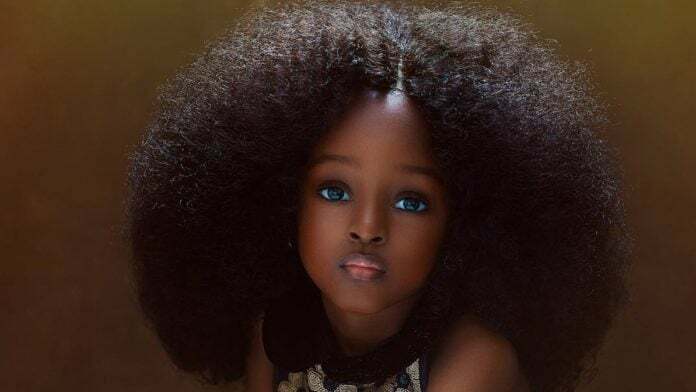 Five-year-old Jare, from Nigeria, has been dubbed the “most beautiful girl in the world” after Nigerian photographer, Mofe Bamuyiwa posted three gorgeous portraits of her last week. The images showcase the child’s big doe eyes, perfectly smooth skin and impressive head of natural hair as she gazes into the camera. “Oh yes she’s human ! She’s also an angel!” Barmuyiwa writes. Although Jare is not a professional model, Barmuyiwa told Yahoo Lifestyle that she convinced the Jare’s mother to start an Instagram page, which has already attracted more than 5,000 followers. The young girl is the latest in a trend of children going viral for their naturally stunning looks. Previously, 17-year-old, French model Thylane Blondeau was also hailed as “the most beautiful girl in the world” after her pictures were published in a Vogue Paris supplement called Vogue Enfants, at the age of six. This launched a succesfull modeling career and now other young models have been discovered in a similar way on social media. Something tells us Jare, who has two sisters, Jomi, 7, and Joba, 10, who also have “striking features” may very well be next in line.